The day when you could become a US Legal Permanent Resident (LPR) simply by walking off of your boat has long passed. 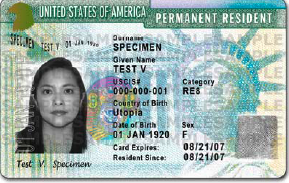 Since that time, paperwork or cards documenting an immigrant’s status have taken various forms, the most well known being the “green card.” The “green card” was a plastic laminated card issued by the US Immigration and Nationality Service (INS) so that immigrants could demonstrate that they were legally in the USA. Here in Los Angeles at Fong & Aquino, virtually everyone — even the attorneys — will at least some of the time call the Legal Permanent Resident card “the green card” It’s simply a habit. The card ceased to be green over 25 years ago. This week, US Citizenship and Immigration Services (USCIS, the successor to the INS) announced that it has redesigned the LPR card. It will now have a multitude of security and safety features. The redesigned card has media which will store photo and biometrics of the cardholder; holographic images and laser-engraved fingerprints are supposed to make the card “nearly impossible to reproduce.” The LPR card will now also, like US Passports, have a Radio Frequency Identification (RFID) chip, allowing the card to be read from a distance. And the card will be green once more.